Here’s another example of the way illusion effects have been used in decorative art designs. (For examples in earlier posts, check out the category Illusions and Aesthetics, to the right). 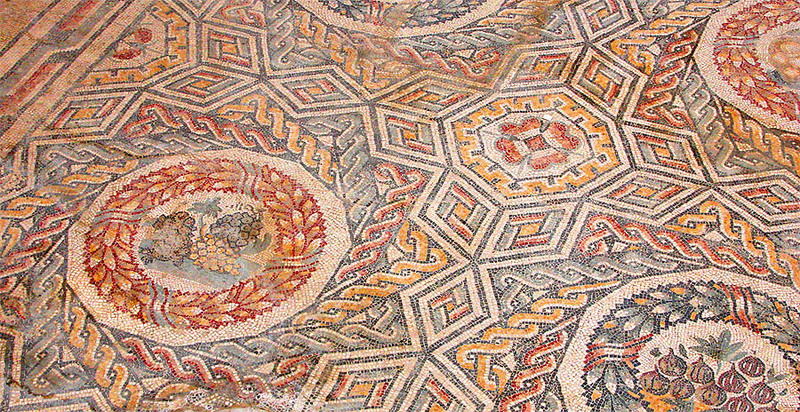 This mosaic is one of many from the Villa Romana del Casale, in the middle of Sicily, Southern Italy. 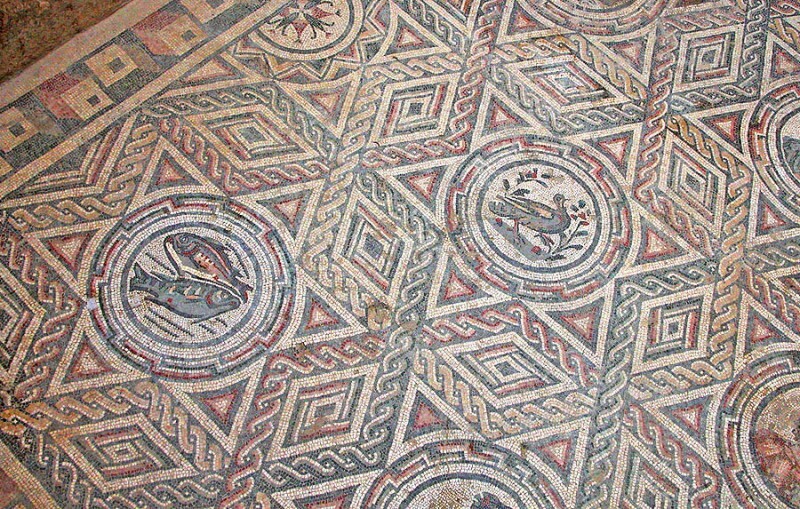 Only the floors of this Roman villa are left. They are about 1700 years old, and are the largest expanses of mosaic floor surviving from the ancient classical mediterranean world. The illusion comes in because different shapes in the design tend to pop out from one moment to the next. For example, in the pictures below I’ve selected out a star and a string of lozenges in the picture on the left, and then a hexagon shape in the picture on the right. Note that the hexagon interlocks with the star beside it with no gaps between them or overlaps, but when we select one, the other kind of vanishes, not only in these demo pictures, but even in the big picture at the start of the post. It’s a figure/ground effect, as in the faces/vase illusion, but without the dramatic light/dark contrast of faces and vase. Here’s another bit of floor, with even more complicated ambiguous effects at work. I should say that I’ve just tidied up these images a bit, and tweaked the colour, because the original mosaics are not in great shape. I can’t resist adding the most famous floor from Casale, even though it’s not an illusion. Far from it, at a late stage in the life of the villa, someone seems to have found all the geometry a bit brainy, and covered it up with something a bit easier on the eye. Soon thereafter the Roman Empire collapsed, and the villa fell into ruins. Should have stuck with the illusions, eh?